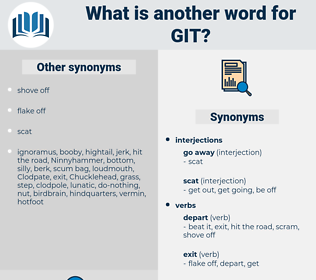 What is another word for Git? come in, join, linger, continue, enter, occupy, wait, combine, fill, persevere, remain, stay, come, keep to, arrive. dissuade, go in, discourage, surrender, stop. 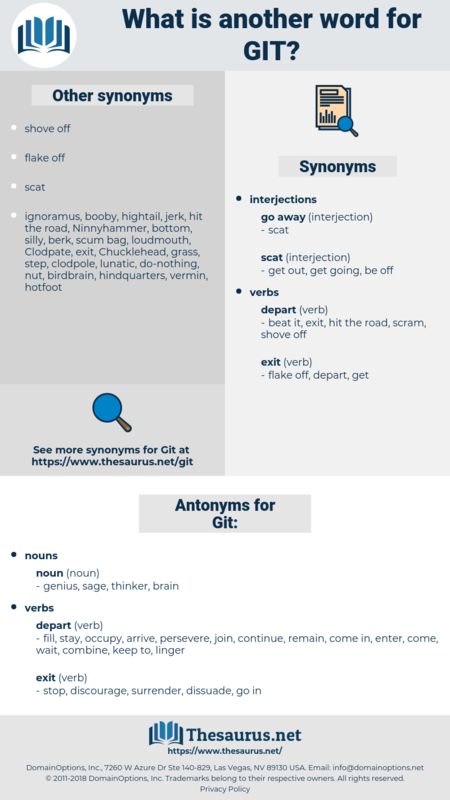 It's always as well to be ready to git. I thort I'd git a chance this evenin', but they come sooner'n I was expectin' 'em. gaudy, gas jet, goaded, goethe, ghost weed, guided, gazette, goudy, ghatti, gaiety, ghat, gait, goody, gaseous state, Gita, gusty, gadoid, gouty, Gide, gouda, get ahead, guyot, goatee, gashed, go ahead, gusto, gate, go to, gateau, get, gat, gusseted, giotto, ghetto, godhead, guaiac wood, g suit, good, gout, goth, go out, get at, get out, gestate, gothite, gatt, geta, get it, goad, guide, guest, goateed, gasket, get to, gaddi, god, gaudi, good day, gist, go with, get away, gusset, go steady, gust, gut, getaway, gussied, goethite, go-ahead, gad, ghost, gigot, gouge out, giddy, gas heat, gd, godwit, goat, gaud, gadidae, gateway, geode.